Hey all, and welcome to my first installment of When I'm Not Reading. I want to start off by saying there are loads and loads of awesomesauce bloggers out there who take so much time to read and review we author's books. They work hard to promote us and to shed light on those books that might otherwise not be seen. That should be commended! With that being said, that's why I'm starting to post these. I'm hoping each Sunday to promote another blogger. Come along for the ride! Welcome, Julie! I'm glad you had some time to stop by today! We'll jump right in with the questions, if you don't mind. What are some of your pastimes while you're not reading? Hah, excellent! I love Big Bang Theory, The Vampire Diaries, and True Blood myself. Who are your favorite characters in the series? Big Bang Theory: Sheldon before this season and now Leonard, especially when Leonard sticks it to Sheldon. I like how Leonard is a nerd but still 'normal'. True Blood: Pam, Eric's prodigy. She cracks me up with her loathing of Sookie always getting in the way or in trouble, and calling it like it is. Pam doesn't know what these guys see in Sookie either! Pam is sarcastic but ends up doing the "right" thing when push comes to shove. Ah, I love Sheldon! His one-liners crack me up. And I must say, I was really rooting for Stefan, but Damon is totally winning me over. :) Anyway, what's one of your favorite places to go to take it easy/have fun? That's a good thing! But, if you could go somewhere, where is one place you'd love to see someday? Nice! I'm sure both places are amazing. Even though this is about what you do when you're not reading, I've got to ask some bookish questions, so here they go! :) First off, what made you start blogging? I left working in a public school system full time and started to miss talking books with students and other teachers on a daily basis. I ran across a blog post by one of my favorite authors in the summer 2010 where she was going to be doing a Q&A on twitter hosted by Electrifying Reviews. “Huh? A blog that does book reviews? 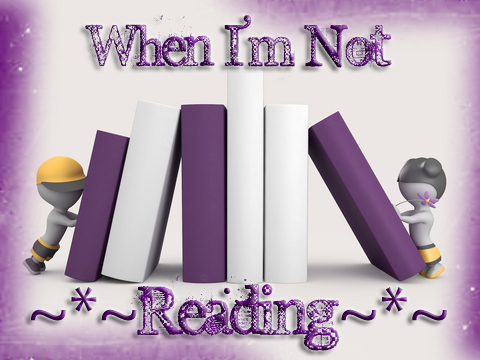 ?” I had no idea there were book blogs like that! So, after seeing what book blogs were all about, I started my own as a new avenue to talk books. That's awesome! I'm so glad you saw that blog, then. :) I'm new to blogging, so let me ask you this, do you have a favorite meme you participate in? There's so many to choose from! I'm actually starting a feature for 2012 where every month on a Wednesday I will have one of the hot male (maybe sometimes female) characters on Called Dinner & a Chat. They character will be picking where we are having dinner, what he would order, you know set the scene. Then it's open mic for fans/readers to ask him questions throughout the day. The author will then keep checking back and answer the questions in that character's POV. I'm excited to see if it works out well. Abbi Glines and Dank from Existence will be first this coming Wednesday. Do you have a certain place you like to read? Nope, I can read anywhere. When the weather is nice I read on my patio. I read laying down on the couch, sitting next to my husband while he plays COD, while I’m getting a pedicure, while I wait for my hair color to process at the salon…pretty much anywhere I go I have a book or my Kindle. So THAT'S what you're doing when I'm play COD with him, huh? :) Then read away! I'll try not to give you as hard of a time for not playing games with us from now on. That's what you do now, but what was your favorite book when you were growing up? Hmmm…I really don’t have a favorite book. I have favorite authors. Growing up I hated reading until 6th grade when my mom gave me a Trixie Beldon book. I loved it!! So every Saturday she would take me to the book store and I would get the next book or two in the series. When I finished those I went straight to Stephen King’s IT or Misery, I can’t remember which. But I adored The King growing up. I haven't heard of Truth or The Fine Art of Truth or Dare, but I do know I can't wait to get my hands on Destiny's Fire! I'll be watching for all of those books when they release! I love new books and new authors. Which brings me to my next question: if you could meet any author, alive or dead, who would it be? Ahhhhh!!! So unfair! Just one…Richelle Mead. Sigh. Really unfair…just one. Yes, I’m grumbling. Hah! I'm sorry! I hope you get to meet loads of the authors you want to meet. :) Along the same lines, if you could bring one character from a series to life, who would it be and why? Barrons from The Fever series by Karen Moning. He’s HOT, witty, snarky, clever, feared, protective, good hearted, FIERCE, and he would have to be in love with me or otherwise there would be no point. He’s only the type of guy I want if he acts the way he does with Mack with me. Haha He’s an indifferent jerk otherwise and will sacrifice you to get what he wants. But if he loves you like he does Mack…holy mackerel! Now I'm going to have to go check out that series! You've got me curious about Barrons! I won't keep you too much longer, but one more question for the road: if you could be any kind of otherworldly, what kind would it be, and why? I’d be an angel like Carter from the Georgina Kincaid series by Richelle Mead. He’s on the “good” side, but still has friends on the “bad” side and works with them and humans to help bring good about. He’s very powerful too. Oh wait…he’d have to fall in order to be with anyone but another angel…that’s the only downside. Well hopefully you could find an acceptable angel to be with - there's loads to choose from right now! :) Thanks for stopping by and sharing a bit about yourself! If you enjoyed getting to know Julie, please stop by her blog, A Tale of Many Reviews and check it out! They do great blog tours and have a lot of fun. I've had the pleasure of getting to know Julie inside and outside of reading, and let me tell you, she knows her stuff about books! What are you waiting for? Go check it out! Thanks for having me Megan! I'm actually going to be doing the Dinner and a Chat on Tuesdays. Not sure why I said Wednesday? haha Love the blog look!